Gallia Academy junior Peri Martin (7) hits the ball over the net, during the Blue Angels’ victory on Aug. 28 in Centenary, Ohio. A lot of familiar names representing the champs. A total of a five Blue Angels were chosen on the the 2018 All-Ohio Valley Conference volleyball team, as voted on by the coaches within the eight-team league. Gallia Academy went unbeaten (14-0) in the conference for a third straight year, picking up its fourth OVC title in a row. The Blue Angels claimed all-14 matches in straight games. GAHS head coach Janice Rosier was named league Coach of the Year for the fourth consecutive season and surpassed 100-win mark for her career this fall. Gallia Academy senior Ashton Webb was named to the All-OVC first team for a third straight campaign, after earning a honorable mention spot as a freshman. 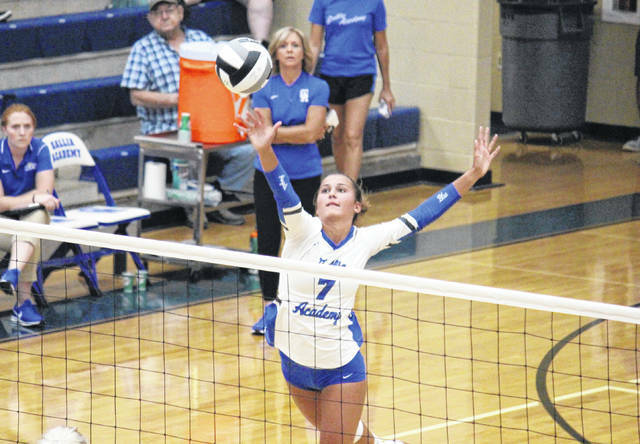 Webb became Gallia Academy’s all-time leader in kills, surpassing 1,000 for her career during her senior season. On the year, Webb had a team-high 369 kills with a 33.1 hitting percentage. Webb earned 74 aces, good enough for second-most on the team, to go with 10 blocks and 172 digs. Joining Webb on the first team for a second straight year are juniors Alex Barnes and Peri Martin. Barnes led the Blue Angels in two categories this fall, with 223 digs and 77 aces. Barnes’ 221 kills were the second-most on the team and led to a 31.0 hitting percentage. Martin — who surpassed 1,000 career assists during the season — also led the Blue Angels in two categories, dishing out 797 assists and earning a 95.8 serve percentage. Martin recorded 41 aces, 29 kills and 18 blocks on the year. Gallia Academy’s honorable mention selection was senior libero Taylor Burnette, who had 49 aces and a serve percentage of 89.6 this season. Burnette had a pair of kills from the back row, while coming up with 193 digs, second-most on the team. GALLIA ACADEMY: Ashton Webb*, Alex Barnes*, Peri Martin*. FAIRLAND: Kelsie Warnock*, Allie Marshall. SOUTH POINT: Rachel Wheeler*, Holly Ramey#. CHESAPEAKE: Karli Davis*, Corinne Ferguson. IRONTON: Samantha Lafon#, Riley Schreck. * — indicates 2017 All-OVC first team selection. # — indicates 2017 All-OVC honorable mention selection.